Yesterday was the Takoma Park Street Festival, and I thought it would be a great chance to bring Sandy out to meet some potential adopters. This is the annual hippie-fest that allows all of us in the "Berkeley of the East Coast" to feel like we're back on the West Coast again. Tie-dye T-shirts, locally made crafts, falafel galore, kids, and dogs. Usually there's a rescue group with some adoptable dogs, but this time Sandy and I had a one-dog adoption event all our own. 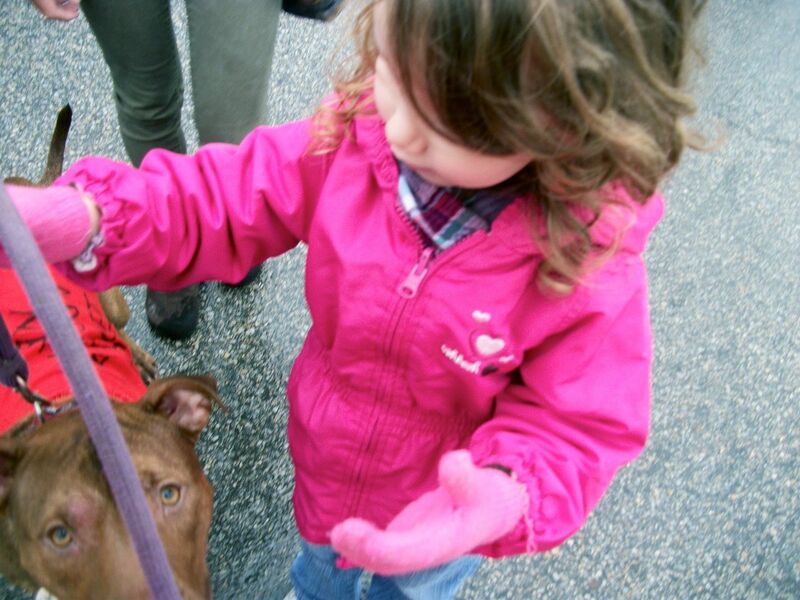 Everyone wanted to pet the little pittie puppy with the homemade orange Adopt Me Vest. Fortunately, the feeling was very mutual. The nicest thing was that the vast majority of people loved her and we heard a chorus of "awwwww" almost everywhere we went. More than a handful of people told me that pit bulls are the best dogs, the most friendly, the most loving, and lamented the popular and media misconception that they are otherwise. We only came across one man who asked if she was a pit bull, and when I confirmed that she was, said he didn't want her too close to his daughter. I tried to do a bit of reeducation, but he was sure he knew what he was talking about and that pit bulls are bred to "turn on their owners" and "fight and kill." Happily, a short time later another young family helped me do the best sort of reeducation right in front of this man. We showed HIM a thing or two, now didn't we? 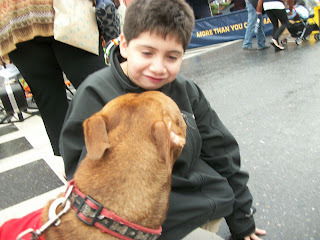 A street festival is a huge amount of stimulation for a dog, and certainly too much for some dogs. 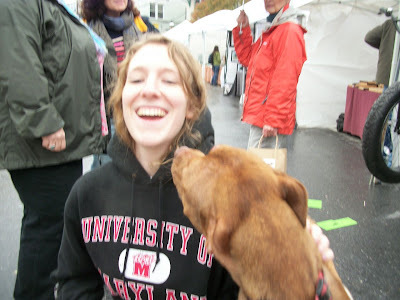 I was so proud that despite all the sounds, smells, people, and other dogs, Sandy was still uniformly happy to greet and be greeted, and even gave a nice sit to people who asked for one. It makes me sad that there is still anyone out there who believes all the irresponsible negativity that's been spread about this breed. I am just glad that Sandy is as committed as I am to dispelling those stereotypes, and is a better spokesperson than I could ever be. Awwwww :) Looks like it was a fun hippie fest. I hope Sandy finds a forever neck nuzzler soon. Sounds like a good event overall-- I'm sorry you were not able to hook up with Narda. Any potential bites? Sometimes it takes a few efforts like this to find good potential matches . . . Fear is a power influence over belief. In my neighbourhood there are many many people who are afraid of dogs in general, even ten-pound Italian greyhounds. 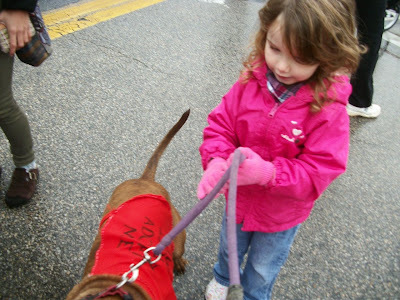 Given that if a pit bull does bite, it can inflict serious damage, people adopt a "better safe than sorry" attitude and avoid what they see as "unnecessary risk." Yet I'll bet some of these people who avoid pit bulls would engage in other risky behaviours, such as bungee jumping, snow-mobiling, smoking, you name it. Everyone has his/her own definition of risk, and some just can't be persuaded. I'm glad you didn't let the one negative reaction discourage you. Sandy is obviously a great ambassador for her breed. Sounds like she had a grand time doing the "meet and greet" and charmed (almost) everyone. Hopefully she will find her Forever Home soon. 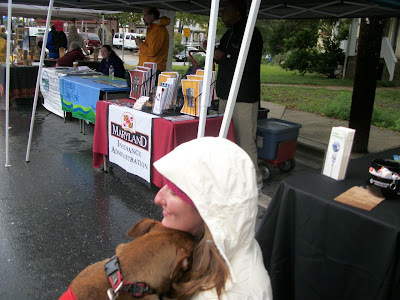 She did have a good time, and so did I. I hope she stays this gregarious and sweet--if the other pitties I've met are any indication, she will. One Person, You raise such good points. I was thinking about that--how many people are scared of dogs in general--and thinking of how that attitude makes me feel sad and frustrated too. They're all prejudices, but I guess people have reasons for their prejudices and the best approach to overcome them is just compassion. Dear Sandy, she is just a lovely girl. I hate to admit it, I was one of those people who did not trust the breed, that is until Betty (a beautiful black pit) was abandoned at our house with a litter of puppies. What a love. What a perfect dog she was. It took me a whole year before I found a family that deserved her. She is now the most loved dog ever. I wish the same for Sweet Sandy. What a fun event! 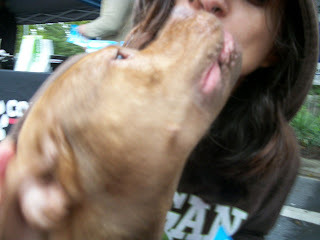 Sandy is so beautiful and a perfect spokesdog for Pitties :) Hope she finds her wonderful furever home soon! Looks like Sandy is a wonderful ambassodoress for Pitties:) How could anyone resist that lovely little face? The street festival looks like heaps of fun for everyone!